LeadsCon West is a major event for All Star that everyone on the Sales team started preparing for long before it actually happened. As much as everybody was excited about meeting their customers, pitching new ideas and putting faces to names, this was my first time in Vegas and the first time I had an opportunity to represent the company and the business development team— therefore thrice the excitement everybody else had. I arrived on Monday, March 20th and had some free time before busy Tuesday to see Vegas, rest after the flight and get ready for meetings the next day. Vegas is an amazing place like nowhere else in the world. I always wondered why all the conventions and exhibitions in the States take place in Vegas, and, after spending a few hours there, I figured that it’s a perfect place; there’s everything that you can think of for every kind of event, taste and wallet. Tuesday began with a customer meeting at 10 AM together with Associate Account Manager Nathan Thramer and Senior Account Manager Krystal Dupar, and a customer lunch meeting followed at 11:30 AM together with Senior Account Manager Courtney Crooks. Getting together one-on-one gives us an opportunity to assess what the relationship has been so far and gain a better understanding of the customers’ needs to make sure the relationship is beneficial. After a quick conference floor meeting with another potential partner followed our Patio Party at the Paris Beer Park. It was a great way for the team and the customers to wrap things up in a relaxed atmosphere and enjoy some extra time together outside meetings. We enjoyed hosting our partners for appetizers, drinks and raffle prizes. Since that was my first time at LeadsCon, everybody was interested to hear my takeaways and impressions. The biggest takeaway was that LeadsCon was a great opportunity for the team to accomplish a lot more in just a few days than we’re able to do in the office over the phone and via e-mail. Our business is not transactional, and, for us, as an employee-owned company, it’s important to get to know our partners as people in person to build great, long-term partnerships to win together. Our sales and marketing teams had 44 amazing and productive meetings in three days. Impressive, isn’t it? LeadsCon was not only an opportunity for great meetings and new business but also a great time for the team to spend together, have lunches and dinners, and celebrate our success. I really enjoyed being in Vegas, seeing the outstanding results of our meetings and the celebration of our company’s success. 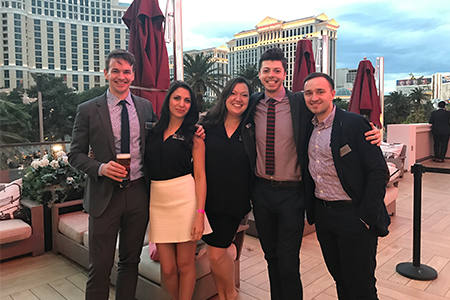 Kudos to Strategic Accounts Senior Sales Manager Carissa Masuda, Business Development Manager Grant Daniels, Senior Account Manager Courtney Crooks and Associate Account Manager Trevar McNamee for working together on organizing our stay and all the events – that was a big contributor to our success!